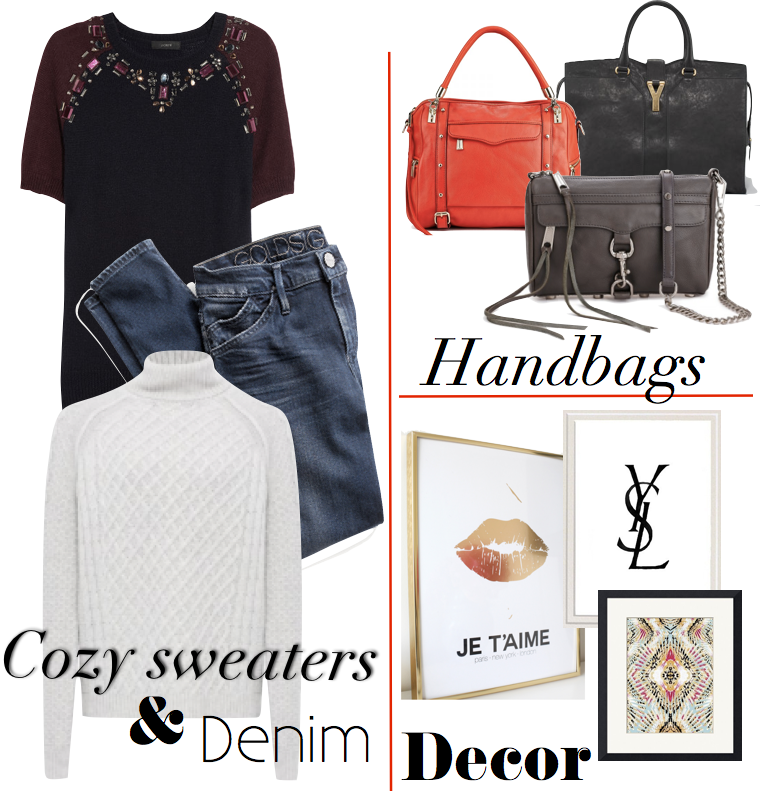 COZY SWEATERS & DENIM: What better way to snuggle up when the temps begin to fall than with this J. Crew crystal embellished knit sweater or this raglan sleeved textured turtleneck from Vince? Pair your favorite choice with a soft pair of great fitting Goldsign for J. Crew jeans. HANDBAGS: What girl doesn't adore a gorgeous handbag? From the feel to the look to the functionality, there are several requirements to meet. When you find that beautiful bag that does, it's like love at first sight. These three charmers are prime contenders. If a classic shape and style are what you adore then this YSL Cabas Chyc tote bag is perfection. For color that doesn't quit, Rebecca Minkoff's Cupid bag has designs on your heart. Finally, trendsetters rejoice, Minkoff does it again with her iconic Mini M.A.C. bag, that offers that on trend look we love and puts everything you need instantly at your hands-free fingertips. So in love! DECOR: The change in seasons begs for a refreshing change of those intricate details that define your home as a welcoming abode. These framed prints speak volumes to me as they effortless depict my personal taste and style. Have an affinity for a favorite city or design? Why not have your artwork professionally framed? These prints are as beautiful as they are unusual. That's just the right mix for anyone whose style shows us who they are. 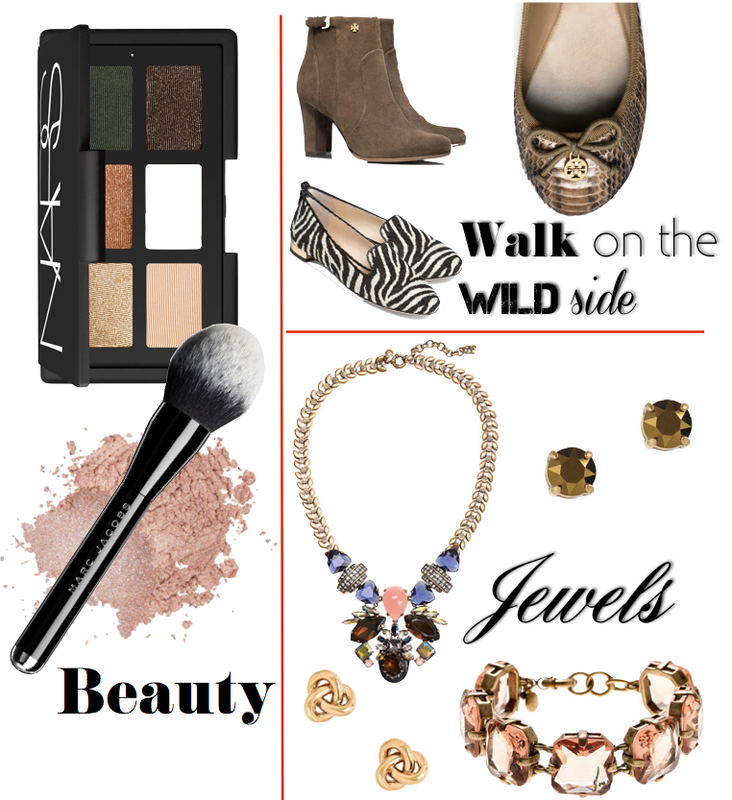 BEAUTY: I always love embracing the colors, textures and mood of the given season. NARS has done just that this fall with their gorgeous Ride Up to the Moon palette. Also fresh on the scene is the incomparable Marc Jacobs whose cosmetics line hit store shelves earlier this month. Along with some fabulous make-up picks, Jacobs' line also offers these beautifully crafted brushes for an artfully applied finish to your look. WALK ON THE WILD SIDE: Footwear is always crave-worthy regardless of the season. This fall calls for a touch of animal instincts and richly-designed fabrics. Tory Burch leads the way with her suede Milan bootie. The perfect height and available in season savvy shades, this pair plays chameleon as it can easily dress up or down. The same can be said for her much loved flats. The texture and color of these snakeskin Chelsea ballet flats make them a strong contender for my shoe closet. If a sense of luxe from an era gone by is more your style, then a smoking slipper could be your Cinderella fit. The Adeline loafer combines zebra print with lovely elegance and charm. JEWELS: The perfect finishing touch to any outfit is, of course, the jewelry. Whether bold and brilliant or delicate and demure, these finishing touches complete the look while enchanting the eye. J. Crew has blazed a beautiful trail for all to follow along the accessories path. I love so many of their pieces and have been fortunate enough have collected a few so far. Some of the latest eye catchers I'm admiring include this symmetrical stone statement necklace. Its combination of spring shade stones alongside autumnal hues make it a perfect go-to piece year round. The matching Swarovski crystal dot earrings are the perfect complement. For more casual days, I love the understated elegance of this golden knot pair. Finally, to finish it all off, no arm party is complete without the addition of a wear it everyday/special occasion piece like this brilliant octagon glass stone beauty. Those Tori Burch booties are just dreamy!